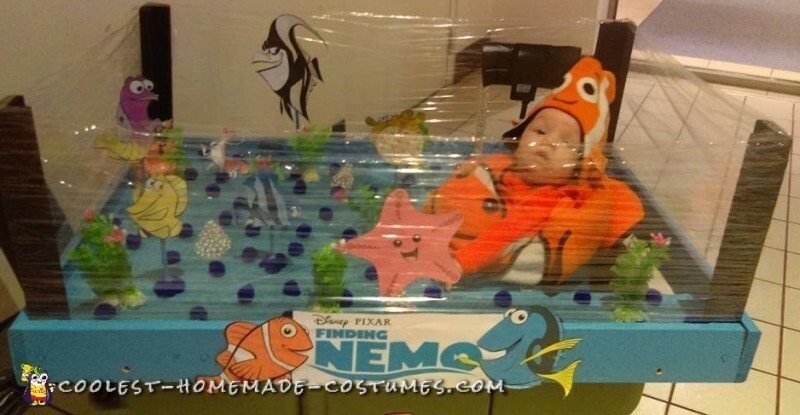 From my 3rd month of pregnancy, on, I have been in love with the Disney Finding Nemo theme. My husband and I even started calling our little guy “fishy” or “Nemo’. Everything was Nemo! Baby Shower, homemade thank you cards, Nursery, come home outfit, literally, EVERYTHING! 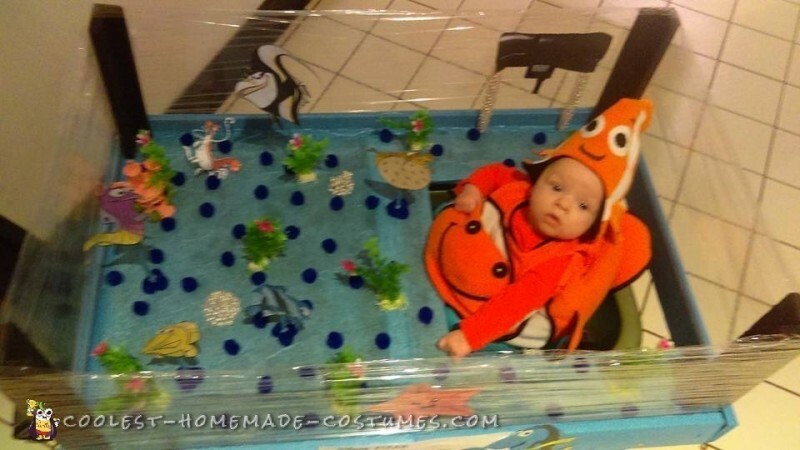 It dawned on me at about 7 months pregnant our little fishy could actually “be Nemo” in a baby Nemo costume on my favorite holiday….Halloween! So, I shared my ideas with Dylan who then said he could BUILD the Aquarium with the wood that’s been sitting out back almost all summer. I then wondered how it would be able to be “mobile” and safe! A wagon!! We could make a higher platform and sit Abel’s (our son) Bumbo in there and make sure it’s nice and secure and build the aquarium “around” him. That’s exactly what we did. My husband built the aquarium out of wood, screws, and wood glue. He painted it with some house paint. We took tissue paper and mod podged it for the bottom of the “tank”. That gave it an awesome effect. It looked like it was actual water! We hot glued some aquarium seaweed on top, along with a castle and some pompoms. I printed out the pictures of the fish who were in the tank with Nemo and then we cut them out and hot glued them to marshmallow sticks my husband cut with the wood saw. I then glued them to the tank as well. We found some beaded garland at the Salvation Army Family Store and to me, it seemed fitting for a fish aquarium, so I grabbed a whole bag…for .49 cents ;) My husband starts gluing them together and they wind up looking like little piles of pearls at the bottom of the ocean! He’s brilliant! He then thought to twirl the beads up the 2 sticks we had left to make them look like bubbles coming down from the filter we later printed and cut out. When the “inside” of the aquarium was just about complete, we wrapped cling wrap around it twice to make it look like glass. On the inside of the “glass” we stuck the Starfish and the filter! All that was left to do was add the title and Marlin & Dory! It took about a week from start to finish. 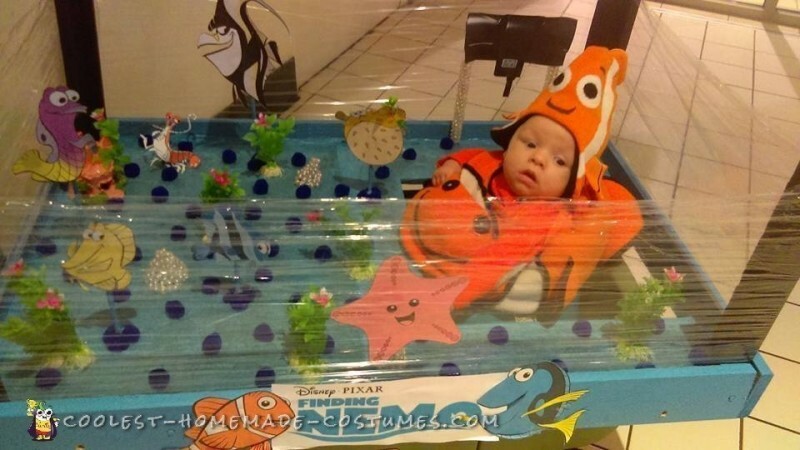 Then when we got our little Nemo in his Nemo costume and hat and put him in his aquarium, we were overfilled with JOY! He was so adorable and stunning! Many agreed how stunning he was when we made his BIG reveal. He attended a Children’s Halloween Party at the local VFW and took home “Cutest” in the 0-2 age group and “Best Overall” out of all the age groups and categories. We were told we should enter him in other contests! On the 27th, we took him to our local mall where they had a trick or treat event. It was raining so we decided to go there instead. Every single person we encountered commented on how great he looked and how wonderful his costume was. Many people said they could tell there was a lot of commitment to make the costume come together. And many commented of the creativity! We were even asked multiple times if his picture could be taken. He was surely a huge hit and we cannot wait to show him and tell him about his very first Halloween when he gets older!